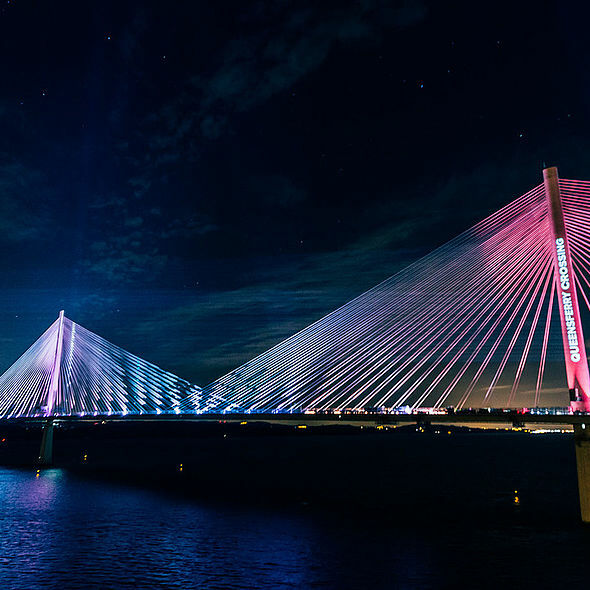 Scotland bristled with pride as the magnificent Queensferry Crossing – the world’s longest triple towered cable stay bridge - was illuminated in all its 2.7 kilometre long and 207 metres high glory - by 60 x Robe BMFL Wash Beams, switched on by First Minister of Scotland, Nicola Sturgeon. 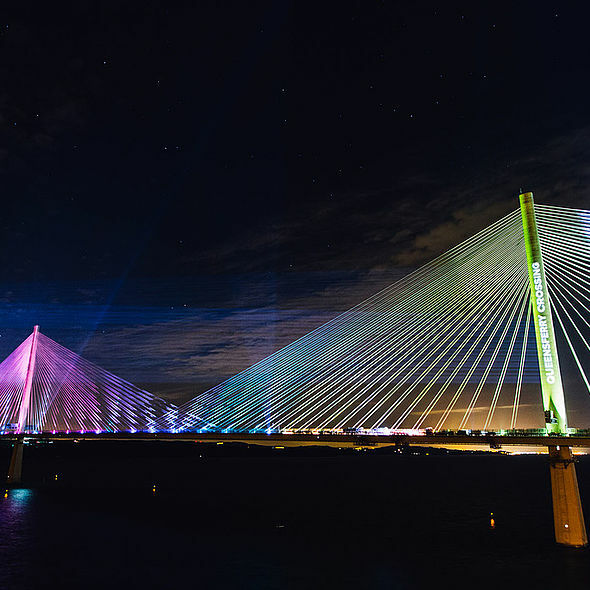 The lighting scheme to achieve the spectacular reveal for the official hand-over ceremony signalling the completion of the £1.35 billion project was designed by event production company JMP Productions, specified and supplied by Edinburgh rental and production specialists Black Light. Their project manager Thomas Ramage worked closely with Jon Pugh from JMP and contacts from Speakeasy and Transport Scotland. 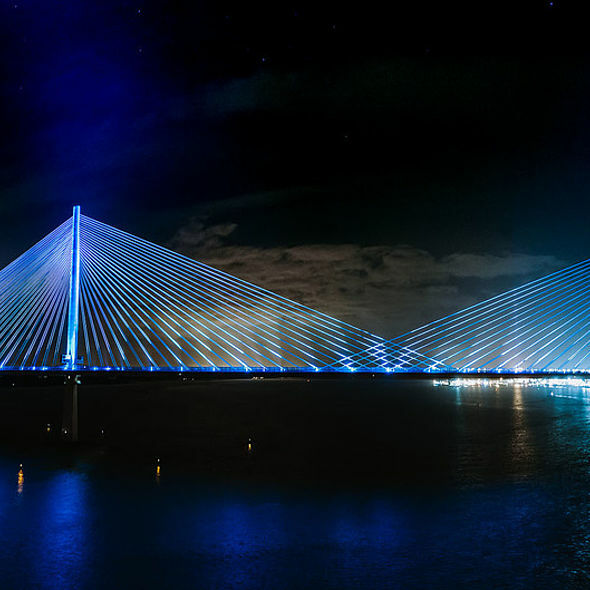 The lighting was part of a mixed-media display which also included projection to reveal Transport Scotland’s impressive master-stroke of engineering and architecture that carries traffic using the M90 highway over the River Forth. Black Light has the largest rental stock of Robe moving lights in Scotland and has invested steadily in the brand in recent years. When asked to light the Crossing, it was a no brainer in terms of which light to choose! “Given the throw distance, we needed the sheer power, intensity and punch of the BMFL” explained Thomas, “coupled with the precision focussing potential of the Wash Beam shutters so we could concentrate light exactly where it was needed with minimal spillage”. This detail was doubly important as lighting and projection worked closely together to maximise the combined visual effect. They also benefited from the excellent colour mixing to give a wide range of bold and confident colour variations, and some of the other finessing characteristics of the BMFL. 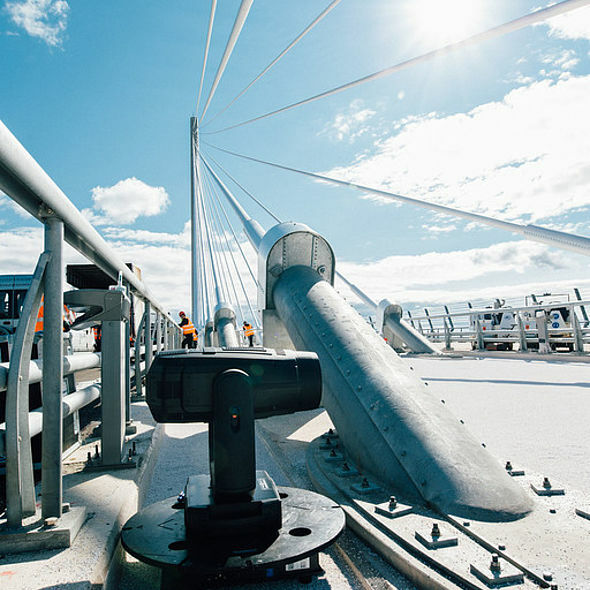 The 60 x BMFL WashBeams were positioned equidistantly along the central reservation of the Queensferry Crossing. From here they were able to shoot upwards and catch the towers and the intricate geometry of the cable stays making up this beautiful and elegant piece of creative engineering. A sequence of effects were programmed for the reveal moment – ranging from beams blasting over to the Forth Road bridge and original Forth (railway) Bridge – which also traverse the water – to washes and texturing on the Queensferry Crossing cable work. Projections (from positions on the Forth Road Bridge and the shore at Queensferry) were beamed onto the northern most of the three commanding 679 ft. high towers and underdeck supports which included text and abstract images. “The BMFLs handled the job absolutely brilliantly,” enthused Thomas. The system was programmed by John Rogers and controlled from a pair of Avolites Quartz consoles run via Titan Net and a dual redundancy fibre network utilising Luminex network switches which was installed for the hand-over event. For the build and the one evening programming session, this was located on the Forth Road Bridge running via a wireless link. From this position the team could clearly see the full effect of the lighting across the Queensferry Crossing. However … to keep the light-up a total surprise from inquisitive members of the press and public … the BMFLs had to be programmed in batches of 10 on that programming night! This ensured that the effect of the whole bridge illuminated was not revealed until the event … all adding extra pressure - and anticipation – for Thomas and the Black Light crew. 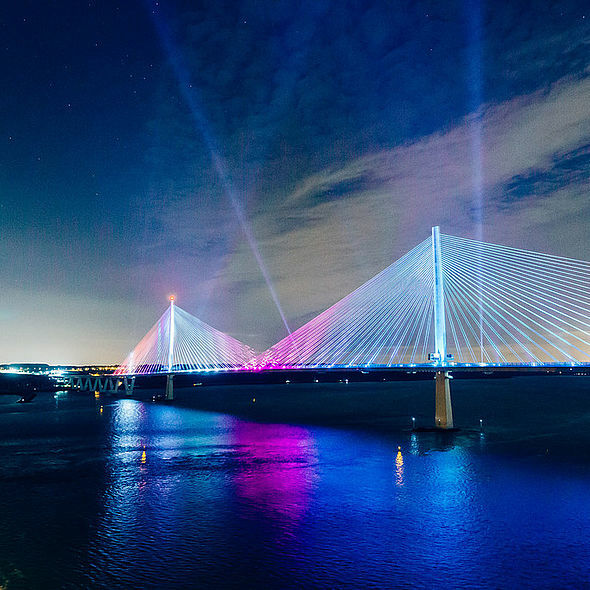 For the show itself, lighting control moved into the centre of all the fixtures on the Queensferry Crossing where they ran Capture visualisations of the show as it was impossible to physically see the effect of the lighting across the bridge from there! Other challenges included working on the site which was running under full CDM rules and regulations as it was a construction zone, which entailed a lot of co-ordination and logistics in terms of access and moving kit and crew on and off site. The Black Light and other technical crews involved in the show all had to undergo all the rigorous health & safety inductions necessary to be working there while FCBC (Forth Crossing Bridge Constructors) completed final works before opening. Also the timescale, between getting the initial inquiry and the go ahead, which was tight, but everyone rose to the historic occasion. “We were all extremely proud to be working on such a high profile event,” stated Thomas adding that it was a real privilege to be able to add their own little touch of magic to the state-of-the-art Queensferry Crossing, one of the most significant civil engineering projects to date in Scottish history. Following the hand-over, the next day the bridge was opened to road traffic, and a few days later on 4th September, HM The Queen officially declared the Queensferry Crossing ‘open’ by cutting a ribbon on the south side. The weekend preceding the official opening, around 50,000 members of the public - given tickets after a ballot - had a once-in-a-lifetime chance to walk the bridge which has no pedestrian access. Queensferry Crossing – the name was chosen by the public from a shortlist - is the third bridge across the River Forth at Queensferry, and is sited west of the Forth Road Bridge completed in 1964 and the Forth Bridge for trains which opened in 1890. The central tower is constructed on Beamer Rock, a small islet in the Forth. 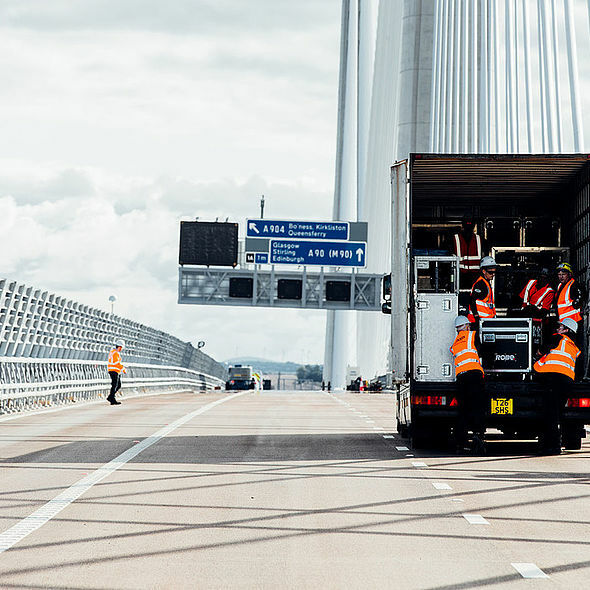 Special wind shielding technology is integral to the design, so it can remain in use during high winds, a scenario that led to regular closures of the original Forth Road Bridge. The amount of steel required for the bridge deck is equivalent to 200 x Boeing 747 airliners! The individual deck segments each weigh 750 tonnes and were constructed in China and Spain, and the approach steel bridge sections were manufactured by Cleveland Bridge in Darlington, UK. 23,000 miles of cabling was used – laying out all the wire used to support the bridge deck would almost stretch around the entire planet Earth! 35,000 tonnes of steel was used in the bridge superstructure and 150,000 tonnes of concrete was poured over the course of the project! In August 2015, the towers reached 10 metres (525 ft. high), making it the UK’s tallest bridge … and completed they stand at the 207 metres as noted in the article. Consortium FCBC (Forth Crossing Bridge Construction) was appointed as the main contractor by Transport Scotland. Consulting engineers Ramboll led the design joint venture which included Sweco and Leonhardt Andra & Partners and Naeem Hussain, global bridge design practice leader at Arup, was the project’s lead design engineer.